During a recent visit to New York, Reb Yisrael Szpilman spoke with Inyan about the Beis Hachaim, his work, and his personal reflections as an observant Jew in Warsaw. Were you born and raised in Poland? I was born in the south of Poland in a city called Katowitz — the city that is famous as being the location of the 1912 [founding asifah of] Agudah, and I spent most of my life there. About 17 years ago, I moved to Warsaw to join the community there. When I moved to Warsaw I was working for the Lauder Foundation that had set up an office in Warsaw. In 2002, I was given a proposition from the Jewish community board to take over the position of the director of the Jewish cemetery. I was probably given this offer because I had been serving on the chevrah kaddisha of Warsaw for years. I accepted it. Since then, for the past 15 years, I’ve been working at this position. Tell us a little bit more about what you do there. What are your primary responsibilities? It’s hard to say what is primary, because every part of the job is important and different. I take care of levayos. Not every Jew who dies in Warsaw is buried in a Jewish cemetery, but I do take care of the chevrah kaddisha. We have about 20 burials a year. Then there is the upkeep of the cemetery. It is huge — 33.5 hectares (over 80 acres). Approximately how many people are buried there? There is a total of about 250,000 people buried there — all Jews. Many of them are buried in sections that are put one on top of another. And there is also a kever achim, a mass grave from the time of the ghetto. So we estimate that of individual graves that you can see, there are about 100,000, but there are obviously many more people buried there. The upkeep of those plots, having a system for cleaning up, cutting the grass, etc., is up to me and my workers. Fifteen years ago, I started to create a database of the people buried in the cemetery, because all the original papers of the chevrah kaddisha were destroyed with the offices, down to the ground, in 1943. Lots of people come to me asking for the graves of their ancestors. “My zeidy, my great-grandfather, my grandmother, my Rebbe is buried here… show me the place.” And for everybody I had the same answer: “I’m very sorry, but I can’t help you because I have no clue who’s buried where. There are no records; they don’t exist.” Finally, I had enough, and I decided to try to register one of the sections. I took the section where most of the Rabbanim are buried, where there are most of the ohalim, and row after row, matzeivah after matzeivah, I put into the computer. I liked this job, and I decided to do another section. I did another and another, and by now, I have registered about 90,000 graves. About six or seven years ago there was an American philanthropist — from Chicago, I believe — who came to Poland and liked the job I did with the records. We wanted to speed it up, so he had a group of students who went through the whole area taking pictures, so there is an online database. I have many more graves, though, because they skipped the matzeivos that are lying on the ground. I lift those up with my workers, so I have many more records than they do. I still have not finished that job. The cemetery is visited by thousands of tourists, mostly organized groups from Eretz Yisrael sent by the Ministry of Education. We have to have the funds to pay for the upkeep of the cemetery somehow, so there is regular ticketing — selling tickets to the tours in order to have money for the upkeep of the place. There are thousands of organized groups, and thousands of individual tourists. [Non-Jewish] citizens of Warsaw and other Polish cities come because they have never seen the Jewish cemetery. They are curious, so they come to visit. The cemetery is busy all the time. For example, during the winter we cut down the trees that have fallen down during the summer storms. Two months ago, we had a terrible storm, one of the biggest storms we ever had, and many, many trees fell down. Many matzeivos were nebach damaged because of that. We do our best to remove those trees. This is work for a lifetime, and even for a couple of generations. You mentioned that there are sections where burials were done on top of one another. That was done before the war? Absolutely, much before. It was done at the beginning of the nineteenth century, when the cemetery was a very tiny place. When they had filled up all the space with graves, they put another layer of earth and dug new graves. Look at the cemetery where the Maharal is buried. There are about 11 layers of earth over there, and you can see one matzeivah next to the other. The level of the cemetery is much, much higher than the level of the street. That’s what they did; there was no other choice. They didn’t have permission to make it wider; that’s why they added another layer. What is the official name of the cemetery in Polish? Right now, it is officially called “Cemetery at Okopowa Street.” Formerly, it was called the Gensha Cemetery. That’s the term that was used for many, many years before the war. This is not the original cemetery in Warsaw. For how many years have people been buried in this cemetery? Two hundred and ten years. There is a cemetery that is 40 years older, in the district of Brudna, in the area of Praga. The area exists, but most of the matzeivos are gone. It was established right after the first half of the nineteenth century. It was in a completely separate district from Warsaw called Praga. Now it is part of the capital. As far as I know, during the Middle Ages there was a Jewish cemetery somewhere near the old city — probably where the Hotel Bristol is standing now. That cemetery does not exist anymore. I heard that during the seventeenth and eighteenth centuries, people from Warsaw were being buried either in Mińsk Mazowiecki, called Novominsk in Yiddish, or Grodzisk; the bodies were taken there. But if it’s true, I have no idea. 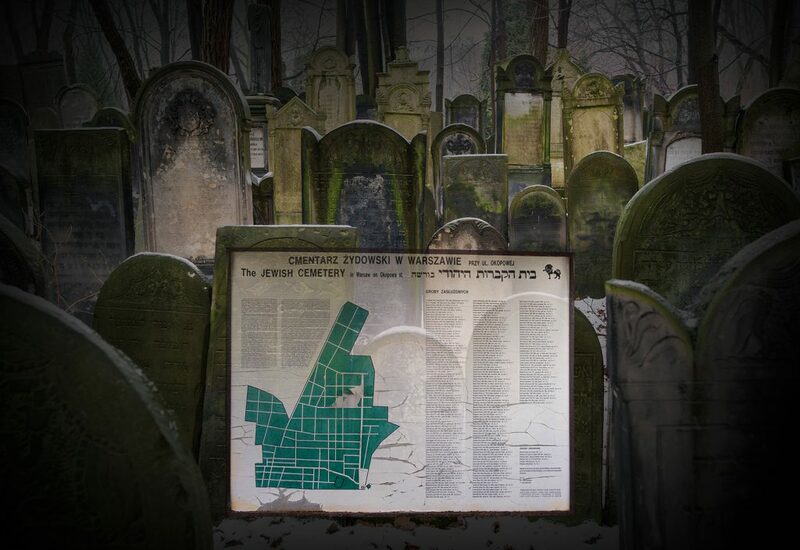 The fact is that we do not know if there was a Jewish cemetery in Warsaw during this time period. What are the oldest kevarim of Rabbanim in the cemetery? They are from the nineteenth century and the beginning of the twentieth century. Most of them are chassidishe Rebbes. There are a few litvishe Gedolim, like Reb Chaim Brisker and the Netziv. As far as I know, Reb Chaim came here for eye surgery, and he was niftar in Warsaw. The legend is that there was a big fight between the Briskers and the Varshavers about where to bury him. Varsha won, so he is buried here next to his grandfather-in-law, the Netziv. The Rabbanim from Warsaw, like Reb Dov Ber Meisels, the Tiferes Yaakov, Chemdas Shlomo, and others, and many chassidishe Rabbanim — the Divrei Yisrael, the first Rebbe of Modzitz, the second, third and fourth Rebbes of Amshinov, the Divrei Shmuel, the second Rebbe of Slonim, Reb Mendele Vorker, the son of Reb Yitzchak, and many, many others. Are there ohalim over these kevarim? Most of them have ohalim, but not all. On many of the Rabbinical kevarim there are just matzeivos. For example, the Rav of Mezritch, the Ostrovtze and Biala. They are three matzeivos next to each other, covered with a black roof made a few years ago. There were burials during the war. The Radomsker Rebbe was niftar in the Warsaw ghetto. The Piaseczna Rebbe’s son was killed at the beginning of the war and was buried in the next row away from his mother and grandmother. Unfortunately, the Piaseczna Rebbe himself, the author of Eish Kodesh is not there. He was killed in the concentration camp, in Trawniki. The last Sochatchover Rebbe is also buried here and, nebach, there is no matzeivah, no writing at all. There is a place surrounded by just a cement fence that is said to be the kever of the Sochatchover. We have been told that some of these ohalim are is severe state of disrepair and are now being repaired and rebuilt. Either families or Chassidim raise the funds for it. I am in charge of supervising these renovations. They’ve renovated lots of ohalim in the past ten years — most of them, actually. What is the general situation at the cemetery? There are different reports. Obviously, compared with other parts of Poland, or the Ukraine where there is total destruction, most of these matzeivos still exist. Correct. The cemetery, which belongs to the Jewish community of Warsaw, wasn’t destroyed by the Nazis during the second World War. Why? I’m sure there are many reasons. As I often say, the Nazis had a lot to do with killing the living inside the ghetto; they left the cemetery for the next step. Also, people were dying on the streets every day, so the cart was always running, collecting the bodies and taking them to the Jewish cemetery to bury them in the very big mass grave. Is the mass grave marked? Yes, absolutely. The border is surrounded by white stones that have black stripes on them. Two years ago we planted plants that will spread all over the kever, to prevent people from stepping on it. The cemetery was untouched by the Germans. Unfortunately, after the war no one was taking care of it — there were basically no Jews here. Many of the stones — especially the expensive ones like Swedish granite, black granite, marble and others — were gone, because there was not a big choice in the stone-cutting market during the Communist era, and granite and marble were very expensive. So the matzeivos were stolen and polished and sold as new stones. But many of them, baruch Hashem, survived. Weather conditions also take a very big toll here. Even the roots of the trees, by growing, push the tombstones, big and small matzeivos, from below. And during the summertime, there are storms that cause the trees to fall and smash whatever is in their way. So many of the matzeivos are destroyed, many are lying down; we do our best to repair them, but this is a lifelong job. We have two physical workers, for heavy tasks, and one lady who sits in the office. If there would be more funding, could more be done? It is necessary to have hundreds of human hands, years of work, and wagons of money, to bring the full view of the cemetery back. Also, you can clean up and cut down the bushes in one section but unfortunately, in two months, you have to come back and do the same job, because it grows back! In this cemetery, are there separate sections for Orthodox and non-Orthodox? Correct. The cemetery was universal; it was for all kinds of Jews and still is: traditional, Orthodox, Chassidim, Litvaks, and maskilim — completely secular people — like Bundists, Zionists and others. But there is a division and separation between the Orthodox and non-Orthodox sections. Among the Orthodox, there is a division between men and women, despite the fact that Rav Dov Ber Meisels made a ruling saying that there is no problem with a couple, a husband and wife, being buried next to each other. Still, the Orthodox people kept them separate. In the non-Orthodox sections there is no separation; men and women are buried next to each other and, of course, the architecture of the tombstones is much different than among the Orthodox. 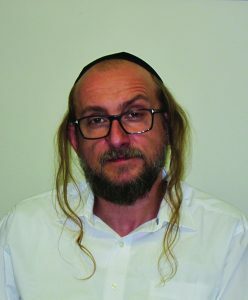 What percentage do you think is Orthodox? I would say, for sure, 70 percent. Which kevarim are visited most often? Of course, each kind of group has its own preferences. The Orthodox go mostly to Reb Chaim Brisker. He is universal, for everybody; no matter if they are litvish or chassidish, most people go to Reb Chaim. Satmar people, I don’t know why, go mostly to the Plotzker Gaon, the Maharal Tzintz. Then there are those who go to the kevarim of the Modzitzer, Radomsker, Amshinover Rebbes, etc.